Lutein and zeaxanthin are the only carotenoids found in the retina of the eye, specifically in the macula (the center of the retina), and in the lens of the eye, where they act as efficient absorbers of blue light. The blue light is believed to be a contributing factor to the onset of age-related macula degeneration and cataracts. It is capable of reaching the deeper layers of the eye involved in vision and causing oxidative damage. The results of studies suggest that dietary lutein and zeaxanthin may slow the development of these dangerous eye diseases by preventing the substantial amounts of the blue light from reaching its targets. 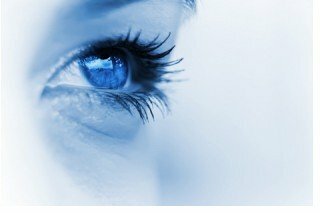 Various research studies have shown that a direct relationship exists between lutein intake and pigmentation in the eye. Several studies also show that an increase in macula pigmentation decreases the risk for eye diseases such as age-related macular degeneration. Scientists also speculate that lutein and zeaxanthin act directly to neutralize free radicals formed in the retina, however, this statement has not been proven yet. Epidemiological studies provide some evidence that higher dietary intakes of lutein and zeaxanthin, higher concentrations of these carotenoids in blood and retina are associated with lower risk of age-related macular degeneration. The available scientific evidence suggests that consuming at least 6 mg a day of lutein and zeaxanthin from fruits and vegetables may decrease the risk of age-related macular degeneration. However, there are studies that found no relationship between dietary intakes of lutein and zeaxanthin, their serum levels and the risk of developing macular degeneration over time. Three large studies found that men and women with the highest intakes of foods that are rich in lutein and zeaxanthin, particularly spinach, kale, and broccoli, were 20-50% less likely to require cataract extraction or develop cataracts. It is not known whether lutein and zeaxanthin supplements can slow the development of cataracts and age-related macular degeneration. The research into the potential benefits of lutein and zeaxanthin for the eye health is ongoing as more evidence is needed to determine whether these findings are related specifically to lutein and zeaxanthin or other factors associated with diets rich in these nutrients. Read the abstracts of the studies with lutein and zeaxanthin here. The Body of Evidence to Support a Protective Role for Lutein and Zeaxanthin in Delaying Chronic Disease: Overview. Lutein and Zeaxanthin Status and Risk of Age-Related Macular Degeneration. A Prospective Study of Carotenoid Intake and Risk of Cataract Extraction in US Men. Some methods used to quantify lutein and zeaxanthin in foods do not separate the two compounds, so they are usually reported as lutein and zeaxanthin, or lutein + zeaxanthin. Food sources of lutein and zeaxanthin: dark green leafy vegetables such as spinach, kale, turnip greens, collards, broccoli; as well as Brussels sprouts, zucchini, squash. For the complete list of foods and Lutein and Zeaxanthin content in them click here.